“Once this universe was created and disposed as much as possible for our respite and benefit, God shaped man, for whom He had created everything. Once man was formed, he lived in Paradise and while in that place there is no mention of marriage whatsoever. He needed a companion, so woman was given to him. But even so, matrimony still did not seem necessary. It still did not exist and they lived very happily in Paradise as if it were Heaven, without knowing marriage, rejoicing in the familiar treatment with God. “However, after that first period, they disobeyed the command of God and were transformed to dust and ashes. They also lost that happy life and the charm of virginity, which left them, abandoning them as God also abandoned them. When they were free from the slavery of the Devil and adored their Lord, they rejoiced in their virginity, which served as a greater adornment than the crowns and gilded robes of kings. This severe verdict on marriage may be hard for the modern man to accept, but this is what St. John Chrysostom – one of the 10 Fathers of the Church – teaches us with authority. In Paradise, before the fall, there was no marriage as we understand it today. 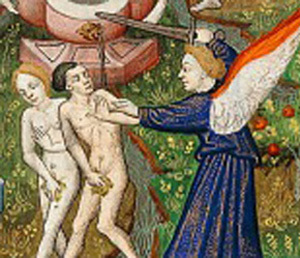 Adam and Eve, our first parents, were virgins, living as brother and sister, unaware that they were married, and without need for it, as St. John Chrysostom observed. They lived quite happily in Paradise in this way until the fall. As such, given that they lived as virgins in the “world” that was Paradise, one could say that they lived like today's lay celibates. Thus do we see that virginity is always superior to marriage because this was God’s original plan for man, to live in a blissful purity similar to that of the Angels, a purity so radiant and fruitful that it is possible that, had they not sinned, procreation could have been designed in an elevated manner, devoid of the prosaic aspects of the marital act as we know it today with the pains of childbirth that was a punishment of original sin. It is certainly an interesting thought to consider. This hypothesis becomes less difficult to accept when we consider that in the Holy Family, the Savior of mankind, Our Lord Jesus Christ, was born of a couple – Our Lady and St. Joseph – who were both virgins for life. The Incarnation of the Word took place by means of the words of St. Gabriel, duly blessed by the Holy Ghost and the consent of Our Lady, without any physical contact of man and woman. It seems appropriate that some similar process using the word as an expression of the lucid potentialities of the soul – intelligence and will – could have been the normal way of conceiving before the fall, instead of the present day process involving the lowest parts of the body as an expression of the blinded and corrupted sensibilities of man. As St. John Chrysostom emphasizes, we were all destined to live the purity of our first parents until the fall. In view of this, we could say that it is because of the fall that procreation became prosaic, like that of animals. From this came the need for present day matrimony - to ensure both the mutual support of the spouses in the hardships of life and their mutual commitment by a solemn vow. It became a remedy for the inconstancy of a volatile and deficient will. As such, since concupiscence is “ardent,” as St. John Chrysostom says, it has the potential to burn everything; that is to say, it can be the cause of unfaithfulness. Matrimony is the holy fireplace to control this burning concupiscence, so to speak. It contains it within the legitimate limits of marriage. This, I think, was one of the reasons God elevated matrimony to a Sacrament, as a means to ensure that, despite our tendency to sin, man would continue to glorify Him through the sacramental grace of this union. Although virginity is a higher state, it can never be affirmed that marriage is evil. St. John Chrysostom says present day marriage is a reminder of the fall, a “vesture of slavery and death,” but in itself it is good. We can see this in its noble ends: the maintenance of the species, the education of the offspring and the mutual support of the spouses. To consider marriage evil per se is to enter into the heresy of the Manicheans, Encratites and others. For this reason, St. John Chrysostom praises marriage, and so do we. But, just as gold and silver are precious metals, with gold being superior, so also is virginity higher than marriage. Both are praiseworthy states of life, but virginity will always be superior. For virginity makes men akin to Angels, the celestial citizens and brings those who embrace it closer to God, Who is purity itself.